A year-long renovation project to replace a worn out heating system at Southern Aroostook Community School is finally complete. DYER BROOK, Maine — A year-long renovation project to replace a worn out heating system at Southern Aroostook Community School is finally complete. 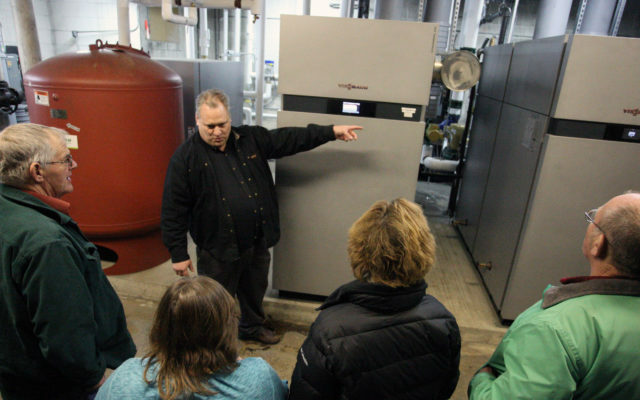 Members of the RSU 50 board inspected the new heating system and other energy improvements made to the school during a Monday, Feb. 11, meeting. As part of a “performance based” contract, the district will pay for the $2,452,850 project over 17 years from the savings on energy costs already built into the budget, according to school officials. The Siemens Corporation did an evaluation of the school and came up with a plan to replace the building heating system, as well as replace a number of inefficient windows at the school. The resulting cost savings, estimated at $75,000 per year, will be used to pay for the upgrades over the loan period, minimizing the impact to local taxpayers. The major focus of the renovations was to update a 41-year-old boiler that was part of the original equipment in the school when it opened in 1976. Tom Seekins, market manager/energy and environmental services for Seimens, said the new propane-based heating system will be vastly more energy efficient than the previous furnaces, which operated on No. 5 fuel oil. The district was faced with little choice but to replace its aging boilers. On Jan. 3, 2018, students at SACS had to be sent home because one of boilers at the school failed, making it too cold in the classrooms. The district paid $21,000 to get that furnace back up and running. In addition to the furnace, the school upgraded the roof, replaced nearly 80 percent of the doors in the school with new energy efficient models, installed updated lighting fixtures, and addressed a number of electrical problems. “There is still quite a bit left to do (for additional improvements), but we were capped at $2.5 million under this system,” Seekins said. The furnace replacement brings a tremendous amount of relief not just for staff and administrators, but students as well.